William Harrison is one of the men whose military record was found by Trevor Lewis and Sheila Marriott, to whom we are grateful. He came from Bottesford, but moved away some years before the outbreak of WW1. He was lost his life in the fighting of March 1918, but has no known grave. William Harrison was born in 1882 and baptised on the 16th September at Bottesford, son of John Thomas Harrison and Mary (nee Knowles). In 1891, at Richard’s Row, High St, Bottesford, lived John Harrison, a 31 year old agricultural labourer from Old Leake, Lincolnshire, Mary (23, from Bottesford), William (8), Robert (6) and Richard (2). William Harrison attested at Leicester on the 4th November, 1915, when he was a farm labourer living at 75 Steward Street, Leicester. 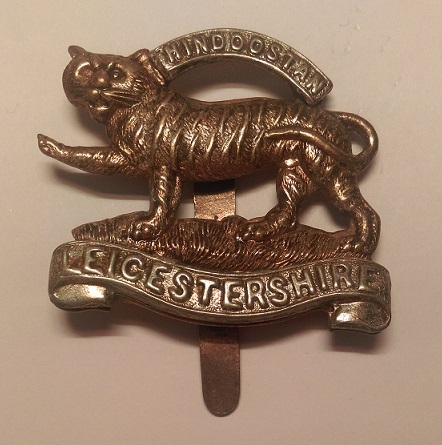 He was posted as 22576 Private in the 11th Battalion of the Leicestershire Regiment. He fought in France, and was posted as Killed in Action on the 22nd March, 1918. There is no known grave, and he is commemorated in Bay 5 of the Arras Memorial, France. He was awarded the British War Medal and Victory Medal, which went to his mother and next of kin, Mary Harrison, at Tomlinson’s Lodge, Rothley. The ‘Long Long Trail’ website indicates that the 11th (Service) Battalion (known as the ‘Midland Pioneers’) was formed at Leicester in October 1915 by the Mayor and a local committee. In March 1916 it landed in France, and on the 1 April 1916 came under orders of 6th Division as a Pioneer Battalion. In the spring of 1918, the Division took part in the Battle of St Quentin and other actions in relation to the German Spring Offensive, and it was probably here that Private Harrison sadly lost his life. Infantry Records (Lichfield) from 30th August 1919 show that surviving members of the family were Richard, 32, Thomas, 27, and Florence, 24, all living at Cossington, Leicestershire, Robert, 39, living at Borrowby, and Grace Roland (nee Harrison), 21, living at Roseberry St., Leicester. Richard Harrison, born in 1889 in Bottesford, got married in 1933 in Grantham to Annie Driver. The date of his death has not been discovered, though it is clear that he survived the war. No military record has been found for him, so it is possible that he did not join the forces. Robert Harrison, born in 1885, was at work in 1901 as an ostler at the public house in Market St, Bottesford, owned by George Goodson. No later records have been discovered for him. Thomas Harrison was born in 1892 in Bottesford, but no other records of him have been found.